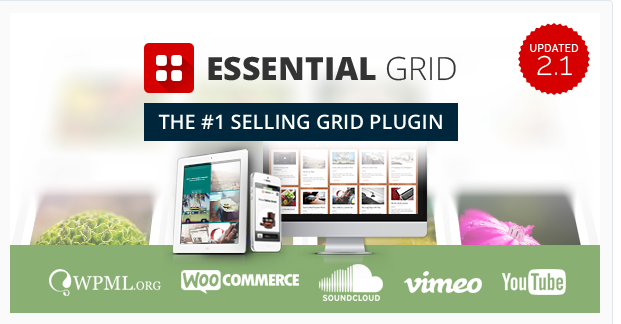 The Post Grid is a fully Responsive & Mobile friendly plugin to display your page/post in Grid, List and Isotope View without any line of coding. It is fast and easy to generate grid from admin end and insert into page/post. You can Display posts by any category(s), tag(s), author(s), keyword(s) also Order posts by Id, Title, Created date, Modified date and Menu order. 50+ Amazing Layouts with Grid, Filtering, Offset, Gallery, Masonry, Google, Pinterest and others. Use posts, pages, Custom Post Type as the source. AJAX Number Pagination (only for Grid layouts). Single popup and Popup with next preview. Order by Id, Title, Created date, Modified date, Random, Comments Count and Menu order. Category, Search and Tags Layout. Button or dropdown for filtering. Query post from your custom post types and create awesome grid.Use any where by short-codes and easy customize via short-code generator page, you can display or hide grid meta items like post authors, post date, post categories, post tags and etc. 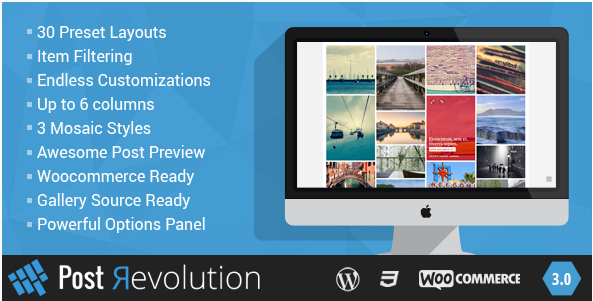 Post Revolution is a powerful WordPress plugin to create unlimited post grid layouts and post lightbox previews. You can choose between 30 amazing layouts already included. Enjoy with Post Revolution and transform your site thanks to endless customizations: grids, loaders, captions, excerpt and preview. 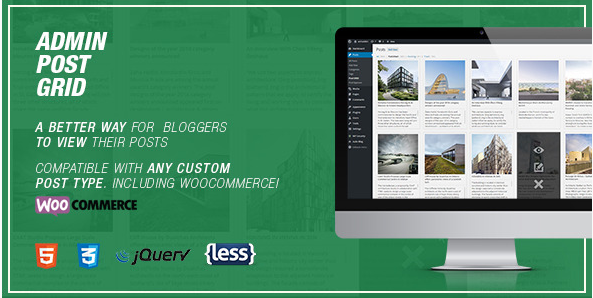 This plugin will allow you to see your posts, pages, custom post types and WooCommerce products in a more visual and intuitive way than the default text list the WP admin interface has to offer. The plugin will create a new sum-menu for each active custom post type on your site (Posts » Post GRID for example) were you?ll be able to view the corresponding entries on a visual grid that includes the featured image, title and content of each post. You?ll be able to filter elements on the grid by status and Preview, Edit or Delete them right there. Post trashing, deletion and restoring are handled using AJAX and jQuery, so when you want to get rid of or restore a particular entry that is exactly what will happen, it will move out of the way without the page reloading and sending you back to the top loosing track of where you were.